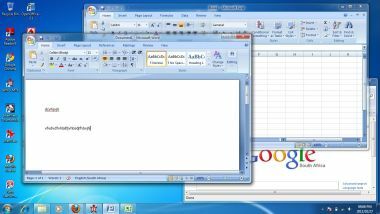 In this section we will delve a little deeper into the world of Windows and Windows 7. This section is not intended to teach you how to use this popular OS, instead it will serve only as an introduction. It's an operating system that's designed to run on x86 architecture computers such as Intel and AMD CPU's. The company that makes this OS is called Microsoft and the founder of Microsoft is Bill Gates, for those of you who didn't know. The latest version is called Windows 7. To understand where this OS actually came from, we need to take a look at it's early beginnings. In 1981 IBM needed an operating system for their IBM PC hardware. Microsoft then bought an OS from another company and modified to to run on IBM's PC's. The OS was called, MS-DOS or Microsoft Disk Operating System. Everyone just called it, DOS. It was hugely popular and other versions were created to run on other vendors hardware and not just IBM. You also had to install it using floppy disks. These were flat, flexible magnetic media disks that the OS came with. 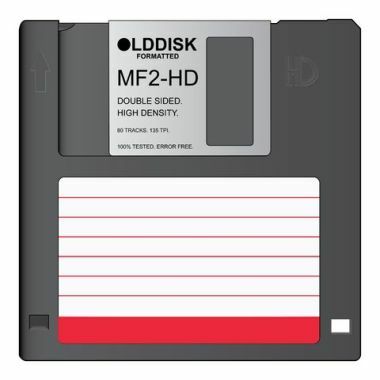 The maximum size of a floppy disk used to be between 720Kb and 1.4Mb. So you can just imagine how small the OS was. It had to fit in less than 720Kb or less than 1.4Mb, depending on the type of drive you had. Today's operating systems uses a GUI or Graphical User Interface. These OS's could easily be over 2.5 Gb in size and ships on DVD media. In the days of DOS there were no GUI's. They used a CLI or Command Line Interface, meaning the OS did not have fancy graphics, everything had to be done by commands. DOS, like any other operating system, is just a bunch of programs that controls how your memory is managed, how disk space is accessed and how your programs are run. It manages your computer while you do your stuff on your PC. 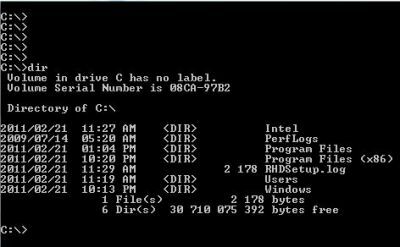 Below is an example of what the dos command prompt looks like. With DOS you had to remember all the commands or use the help command to find information on available commands. For example, let's say you wanted to run a program that's in a directory called mydir and the program is called myprog. Then your program would start up and you could now work with it. The thing about DOS was that you could only run one program at a time. So, you could do only one thing at a time. With today's OS's you can run multiple programs at the same time. In those days, DOS did the job it was programmed to do. Nothing more nothing less. It was an OS. DOS then progressed from one version to another. With each version new features were added. The last real DOS that was released was DOS 6.2x. So, where does windows come in? Most software developers realized that a GUI environment is the way to go. It's easy to use, and you don't have to remember all those commands and directories. GUI's used a concept called icons that represented files, folders and programs. So, instead of remembering what commands to run, you just need to remember what the icon for a program looked like and click on it to run the program. Heck, you didn't even have to remember what icons did what. They placed a description of the file, folder or program below the icon to make it easier to identify. Companies who made these operating systems also bundled a whole bunch of programs with it to make it attractive for users to buy. The first version of Microsoft Windows was ver 1.0. It was very basic but allowed the user to navigate through his system using the graphical user interface or GUI. This first version, and versions up to 3.1, was actually installed on top of DOS. So, you first installed DOS then the GUI on top of it. In 1995, Microsoft created a new version of it's OS called Microsoft Windows 95. In this version, DOS was part of the GUI. So, everything installed at once. There was no need to install DOS and then the GUI. I must say, I used win3.1 and win95, and win95 was really good compared to 3.1. The interface was smooth, the graphics better and the included programs was easy to use. That's to be expected. When you bring out a new version of your product, it needs to be better than the previous. Since Win95, there has been Win98, released in 1998, WinME, or Millennium Edition. Then came XP, Vista and the current release is Windows 7. As you can see, Microsoft has been quite busy creating GUI operating systems, but they did not stop there. Microsoft also created operating systems for mobile computing devices and servers. Microsoft's first server OS was called NT. Today their latest version is called Windows Server 2008 R2. The R2 meaning Release 2. These server versions where created with the server environment in mind so they were a bit more robust than the PC versions. Microsoft also led very successful marketing campaigns and today, when you buy a PC or laptop, it will sell with Windows 7, or some version of Microsoft's OS. So, is Windows 7 the best OS out there? Microsoft had made some bad decisions in it's time, and people take note of this. For instance, the Millennium Edition of their OS was not very successful. People who already used Win98 waited for XP instead of upgrading to ME. People thought that the ME edition was not really a step forward and had performance and hardware problems. WinXP was very popular when it came out and with good reason. The OS was polished and looked much different than previous version. The interface was easy to use, the performance was better and you could get a 64bit version of the OS as well. XP was also the first version that you could buy in different flavors. You could choose between the simpler, home version or the professional version. The professional version had much more functionality and features built in than the home version, and was more expensive. Microsoft's Vista version was also one of those OS's that Microsoft would rather forget as soon as possible. Like ME, it had performance issues and some hardware compatibility issues. They soon fixed it with their current version called Windows 7. Love it, or hate it. Microsoft is here to stay and their OS's as well. Think about it, Microsoft runs their OS's on 91% of PC's and Laptops out there. With that amount of market share, they cannot be all that bad.